Jake Manning gets his lead at first. Photo by Kyle Thornton. 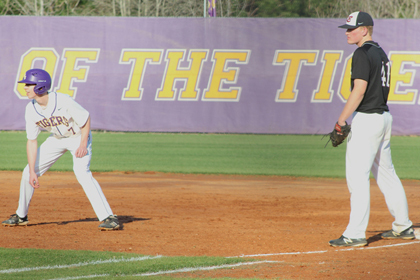 The Tallassee baseball team opened its second season with area play last week. The Tigers split the first two games with Valley and lost the tiebreaker. Valley won the first game on Thursday 7-4 in Valley. Jacob Dantro pitched 3 2/3 innings allowing four runs on four hits. Will Blocker had a two-RBI single. Beau Baker added a hit. Dantro went 2-for-4 at the plate. Tallassee took the first game of Friday's doubleheader in Tallassee 7-6. Beau Baker picked up the win with 5 2/3 innings pitched. He had four strikeouts with three walks and allowed four runs, three earned, on five hits. Jacob Ingram came on in relief to get the Tigers out of a jam in the sixth getting the final two outs with runners at second and third. Jackson Gantt pitched to one batter in the seventh after the Rams had cut the lead to one run with the bases loaded. He got a strikeout to earn the save. Will Blocker, Bobby Baker and Blake Schwab had two hits each. Gantt got the start in the rubber match, an 8-4 Valley win. He pitched four innings, struck out three and walked four, allowing five runs in the defeat. Bobby Baker and Jake Manning had two hits apiece. The final game does not count in the area standings but would be used in the event of tiebreak situation. Tallassee plays Beauregard in area play this week with game dates rescheduled. The Hornets swept Brewbaker Tech in their opening area series last week. The Tigers play Beauregard in Tallassee for a single game on Wednesday, April 3 at 5:00. The Tigers travel to Beauregard for a doubleheader on Thursday at 4:30. The junior varsity Tigers will play a doubleheader on Tuesday, April 2 at Central of Clay County in Lineville at 4:30. The varsity game that day has been canceled. The JV Tigers will make up their game with Holtville on Wednesday at 5:00 at the Babe Ruth complex.